Download "DISTRICT: Date Submitted to DOE: Contact Person s Name Title. Phone # E mail:"
3 Your system will address the components on which evaluation is based. Your documentation must indicate how you conform to all MOU and statutory requirements. a. 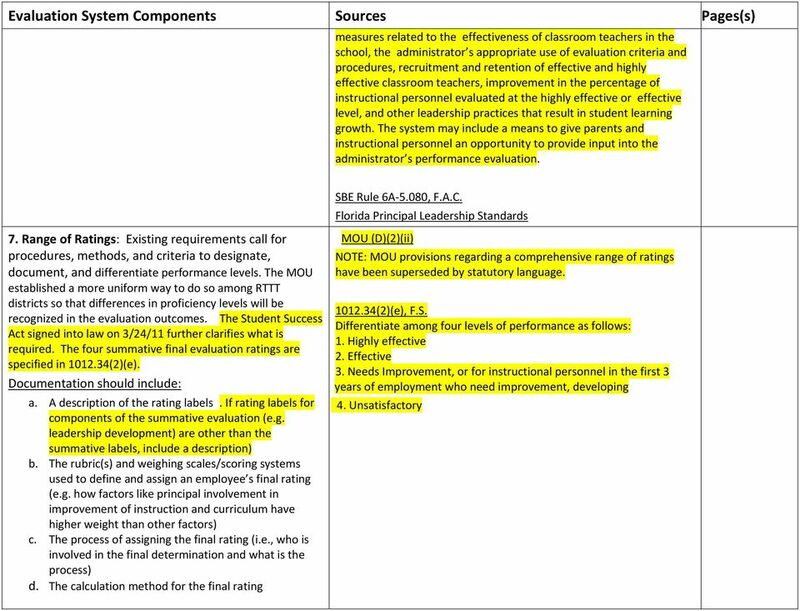 Description of how evaluations for all school administrators are based on sound educational principles and contemporary research in effective educational practices b. Describe your Inclusion of the following evaluation criteria: 1. Performance of students (student growth) 2. Instructional leadership 3. Any additional professional and job responsibilities if included (e.g. Other job responsibilities as adopted by State Board of Education; District may identify additional responsibilities c. Provide evidence that your system Incorporates leadership standards adopted by State Board of Education, including new statutory requirements of performance measures related to: 1. Effectiveness of classroom teachers 2. Recruitment and retention of effective & highly effective teachers; 3. Improvement in the percentage of instructional personnel rated as highly effective & effective; 4. Appropriate use of evaluation criteria; 5. Other practices that result in student learning growth. 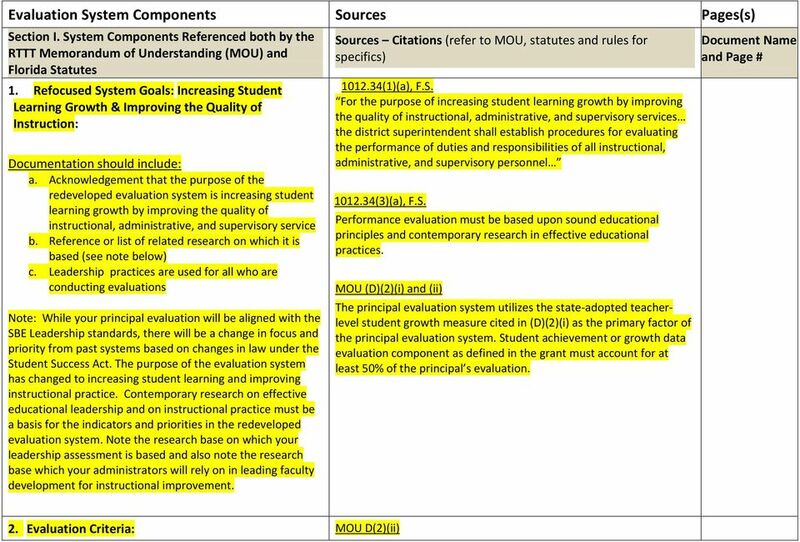 d. May include means to give parents and instructional personnel opportunities to provide input into evaluation e. For ALL Instructional personnel and school administrators: 1. 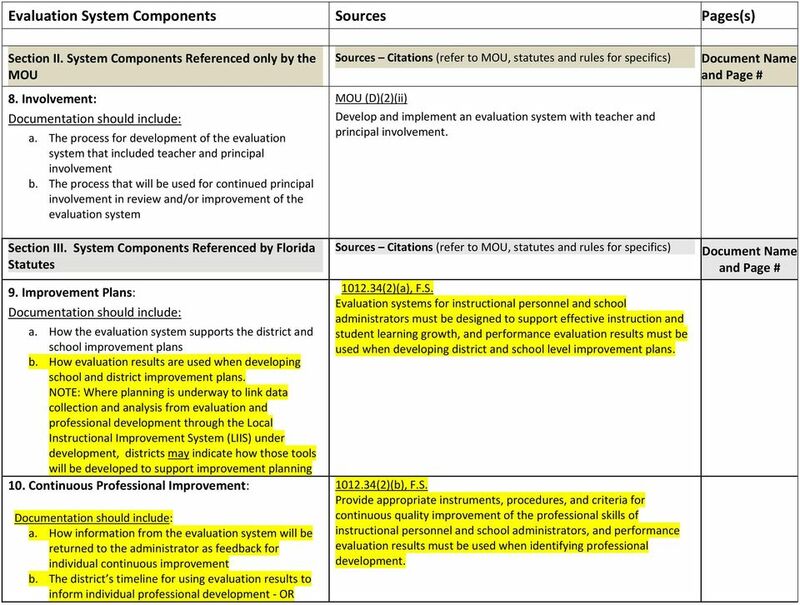 Other job responsibilities as adopted by State Utilizes for the remaining portion of the evaluation the Florida Principal Leadership Standards with an emphasis on recruiting and retaining effective teachers, improving effectiveness of teachers, and removing ineffective teachers (3)(a), F.S. Performance evaluation must be based upon sound educational principles and contemporary research in effective educational practices (3)(a)1, F.S. 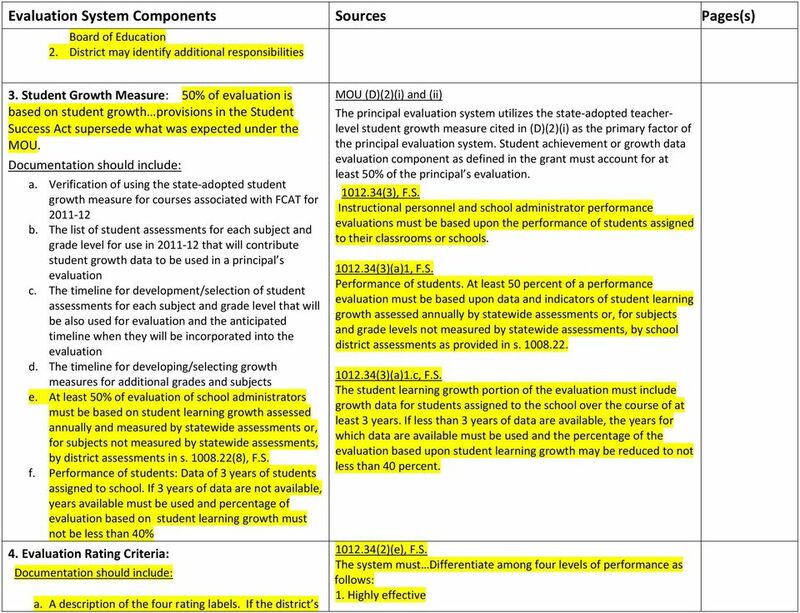 At least 50 percent of a performance evaluation must be based upon data and indicators of student learning growth assessed annually by statewide assessments or, for subjects and grade levels not measured by statewide assessments, by school district assessments as provided in s (8). # (3)(a)3, F.S. 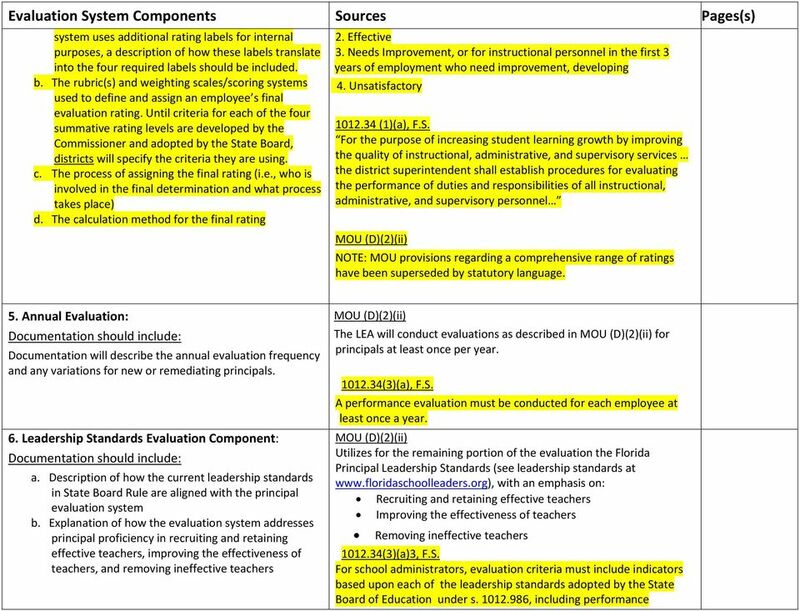 Evaluation criteria must include indicators based upon each of the leadership standards adopted by the State Board of Education (3)(a)4, F.S. 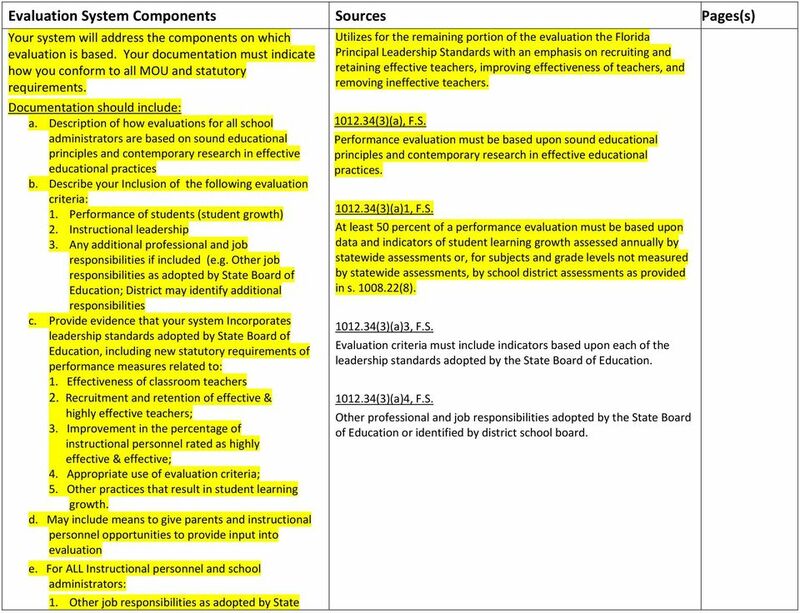 Other professional and job responsibilities adopted by the State Board of Education or identified by district school board. 10 numerous sources. The evaluation system should make clear to all participants which sources of input will be used to inform evaluation and ensure training for personnel whose input may inform evaluation results. 17. 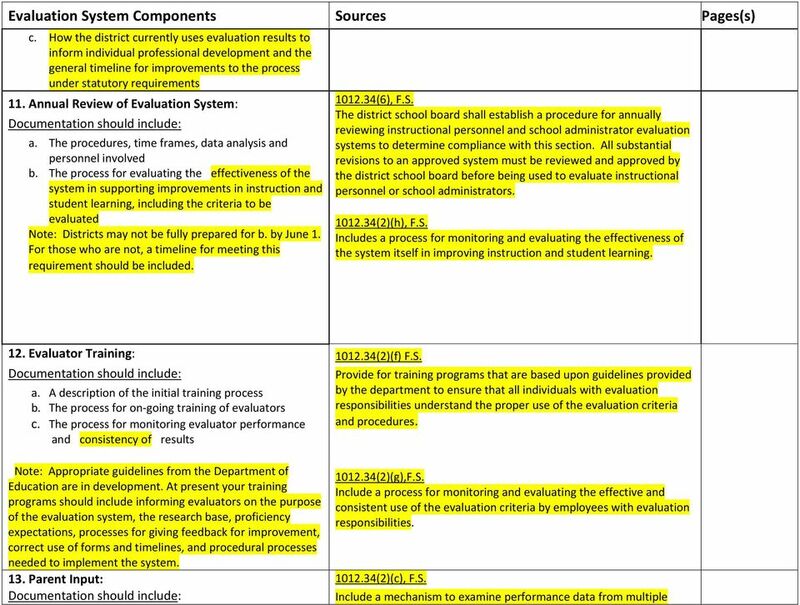 Amending Evaluations: (3)(d), F.S. Documentation should include procedures related to amending evaluations based on receipt of additional data. # 18. 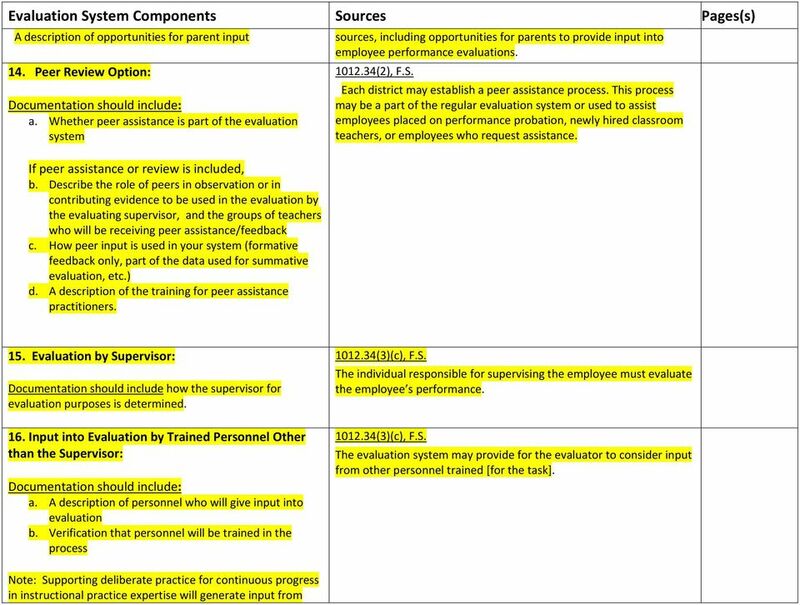 Informing Assessed Personnel: a. 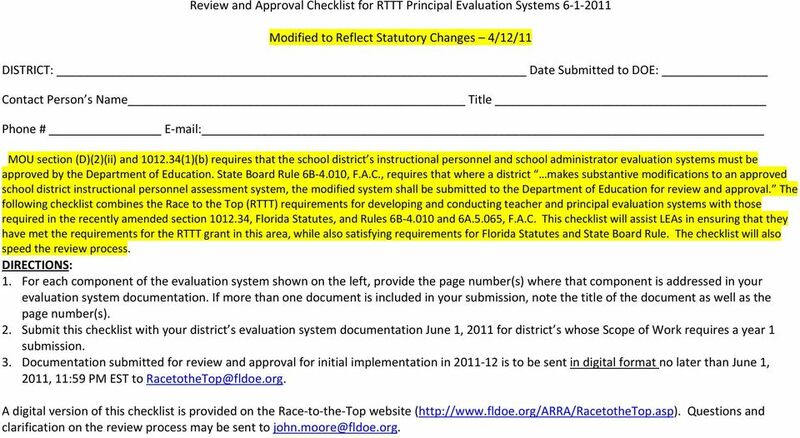 The process whereby personnel are informed of the criteria and procedures by which they will be evaluated, including the transition to the district s new evaluation system under RTTT b. The procedures for new employees who join the workforce The evaluator may amend an evaluation based upon assessment data from the current school year if the data become available within 90 days after the close of the school year. The evaluator must then comply with the [notification] procedures set forth in paragraph (c).# (3)(b), F.S. Fully informs all personnel of the criteria and procedures associated with the evaluation process before the evaluation takes place.